Our cosy, well-kept, 3* bed and breakfast guesthouse is situated on the sunny side of Saalbach only a short walk from the village centre. Comfortably reach the first mountain summit. In Summer – biking or hiking through our beautiful Pinzgauer grass mountains. After a restful night’s sleep, begin the day with an unhurried breakfast in our non-smoking breakfast room. From our self-service breakfast buffet you can choose from a selection of sausages, ham and cheeses as well as muesli, cornflakes and many other delicious things. Breakfast drinks eg. tea and coffee are served by your host. that our sauna is just like a „home from home“. Just advise us of your wishes so that you can have exclusive use of our sauna! Price list available at reception. If your body is tired, whether it’s from skiing, walking or biking, the best way to relax is under the stars in our whirlpool with colour effects. Let the warm water run and lay back – set the force of the jets as you would prefer and let the bubbles caress your body. Tokens can be purchased at reception. More space and more light, that´s what we wanted. You can see the outcome for yourself. With pleasant colours and native wood, we have made our lounge into a cosy seating area. In the computer corner, you can let friends know instantly about your holiday experiences. The computer is coin operated. The mirrors on the ceiling enhance the open feeling of the lounge area. The reception is not always manned – nevertheless, we are here for you from 07.00 – 22.00! Nothing could be easier: Let us know your arrival time at the airport and we organize the Holiday Shuttle for you! For your mountainbike - we have a lockable room in our guesthouse in Saalbach to store your mountain bike. Electronic drying boot stand can be used free of charge to dry your wet shoes and sports clothing. There are plenty of deckchairs available on our sun terrace. Your car is also on holiday – we have limited free parking in front of our guesthouse. The parking area and your car will be cleared of snow for you. To keep you ski and snowboard boots warm and dry, there is a heated ski and boot room. Our bed and breakfast guesthouse team in Saalbach wishes you a relaxing holiday! Send us your enquiry - non mandatory & free of charge! 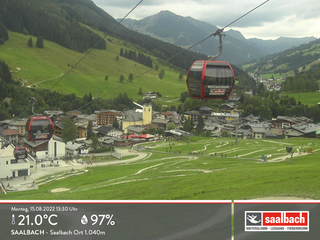 We are partners of the Saalbach Hinterglemm JOKER CARD! As a guest of Pension Schipflinger the Saalbach Hinterglemm JOKER CARD is included during the length of your stay. Unlimited and free use of the lifts, open air swimming pool ‘Captain Hook’, hikers bus, minigolf, tennis and much more.